ABRAXANE is indicated for the treatment of breast cancer after failure of combination chemotherapy for metastatic disease or relapse within 6 months of adjuvant chemotherapy. Prior therapy should have included an anthracycline unless clinically contraindicated. 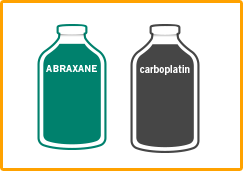 ABRAXANE is indicated for the first-line treatment of locally advanced or metastatic non–small cell lung cancer, in combination with carboplatin, in patients who are not candidates for curative surgery or radiation therapy. ABRAXANE is indicated for the first-line treatment of patients with metastatic adenocarcinoma of the pancreas, in combination with gemcitabine. ABRAXANE is indicated for the first-line treatment of locally advanced or metastatic non–small cell lung cancer, in combination with carboplatin, in patients who are not candidates for curative surgery or radiation therapy. Based on the mechanism of action and findings in animals, ABRAXANE can cause fetal harm when administered to a pregnant woman. Advise females of the potential risk to a fetus and to avoid becoming pregnant while receiving ABRAXANE. References: 1. Referenced with permission from the NCCN Clinical Practice Guidelines in Oncology (NCCN Guidelines® ) for Non-Small Cell Lung Cancer V.9.2017. © National Comprehensive Cancer Network, Inc. 2017. All rights reserved. Accessed October 23, 2017. To view the most recent and complete version of the guideline, go online to NCCN.org. NCCN makes no warranties of any kind whatsoever regarding their content, use or application and disclaims any responsibility for their application or use in any way. 2. American Cancer Society. What is non-small cell lung cancer? https://www.cancer.org/cancer/non-small-cell-lung-cancer/about/what-is-non-small-cell-lung-cancer.html. Accessed March 21, 2017. 3. Cetin K, Ettinger OS, Hei Y, O’Malley CD. Survival by histologic subtype in stage IV nonsmall cell lung cancer based on data from the Surveillance, Epidemiology and End Results Program. Clin Epidemiol. 2011;3:139-148. 4. Drilon A, Rekhtman N, Ladanyi M, Paik P. Squamous-cell carcinomas of the lung: emerging biology, controversies, and the promise of targeted therapy. Lancet Oncol. 2012;13:e418-e426. 5. College of American Pathologists (CAP). Lung cancer: squamous cell carcinoma. https://www.cap.org. 6. Wilson DO, Ryan A, Fuhrman C, et al. Doubling times and CT screen-detected lung cancers in the Pittsburgh Lung Screening Study. Am J Respir Crit Care Med. 2012;185(1):85-89. 7. Veronesi G, Maisonneuve P, Bellomi M, et al. Estimating overdiagnosis in low-dose computed tomography screening for lung cancer: a cohort study. Ann Intern Med. 2012;157:776-784. 8. Moran CA, Suster S. Non-small cell carcinomas of the lung. In: Tumors and Tumor-like Conditions of the Lung and Pleura. 2010; Philadelphia: Elsevier Health Sciences. 9. Pivot X, Thierry-Vuillemin A, Villanueva C, Bazan F. Response rates: a valuable signal of promising activity? Cancer J. 2009;15:361-365. 10. Blumenthal GM, Karuri SW, Zhang H, et al. Overall response rate, progression-free survival, and overall survival with targeted and standard therapies in advanced non-small-cell lung cancer: a US Food and Drug Administration trial-level and patient-level analyses. J Clin Oncol. 2015;33:1008-1014. 11. Socinski MA, Bondarenko I, Karaseva NA, et al. Weekly nab-paclitaxel in combination with carboplatin versus solvent-based paclitaxel plus carboplatin as first-line therapy in patients with advanced non-small-cell lung cancer: Final results of a phase Ill trial. J Clin Oncol. 2012;30(17):2055-2062. 12. Data on file. Celgene Corporation. basis for the approval for ABRXANE for Injectable Suspension. The analyses contained in the article may differ from those in the package insert for ABRAXANE. Please see Important Safety Information and Prescribing Information, including Boxed WARNING. The information contained in this section of www.abraxanepro.com is technical in nature and is intended for US healthcare professionals only.